This is my view every morning. The towering Mt. San Jacinto set aglow with early morning sunlight. 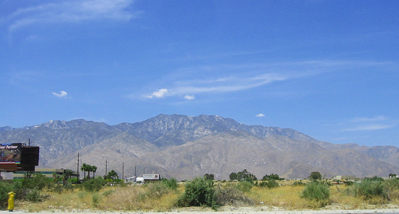 Growing up in Palm Springs, I took my environment for granted. Little did I realize how powerfully it had made its mark. Wherever I was in the world, returning to visit my family would always be accompanied with the anticipation of knowing that soon I would be coming around Windy Point to view my mountain. Not called Windy Point for nothing, you can see one of California’s largest wind farms all along the base of the mountain. Now, watching the desert blossom this springtime, I am home again. Whenever I relocated, I would always look for places where the flat land meets up with a great mountain. Taos is like that. I’ve wanted to live there since my first visit. As a painter, I admire Georgia O’Keefe. 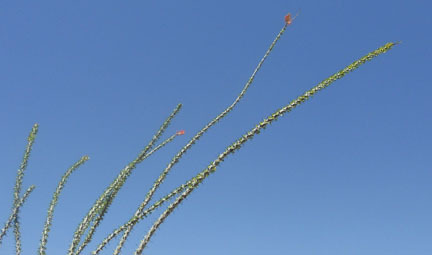 Not only for her desert landscapes with clear blue sky and stark white bones. But also for the life she led. Her life too was a work of art. Living alone in the desert solitude and painting the hills around her, she created a life that reflected her sensibilities and fed her soul. Her environment was perfected suited for her purpose. And now I’ve found that place for myself. Built in the 50’s Miracle Manor Retreat is a haven. You’ve already seen the view. This jewel of the desert landed in my lap at just the right time, giving me the best possible place to acclimate after leaving France. It fit my vision to a tee: wide open spaces, view of the mountain with the desert at my feet, peaceful and quiet. At night, floating in the pool, staring into the vast night sky, I feel the peace I’ve been seeking. And as always, that beautiful desert glow. 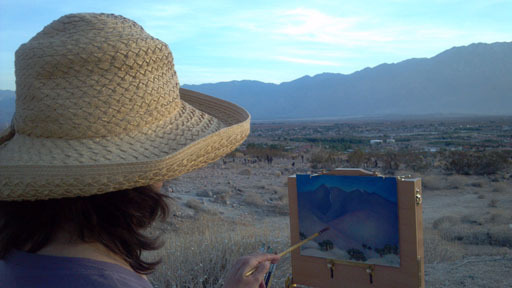 This is the environment that I’ve chosen for the desert edition of Explore Your Creative Spirit 8-week workshop. If you are a woman yearning to create, or explore your creativity, or looking for an inner adventure where you get to know yourself, join me for this series of classes. When: Laguna Beach – Tuesdays beginning May 1st for 8 weeks. 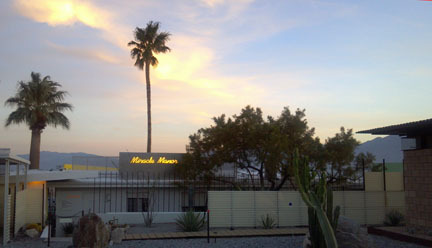 Palm Desert – Thursdays beginning May 3rd for 8 weeks. For our first class, we will meet at an art supply store to go over various media. You can purchase individual supplies at this time. Please click here to register, ask questions or for more details. If you know someone who would love to participate, please forward this information on to her. Recently, I’ve been very nostalgic about my life in France. 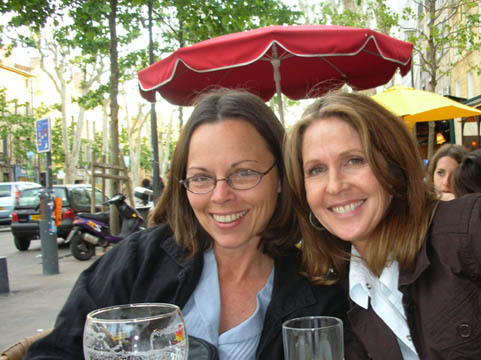 I had the supreme delight to spend eight years living in the village of Vence, just outside Nice on the Cote d’Azur. 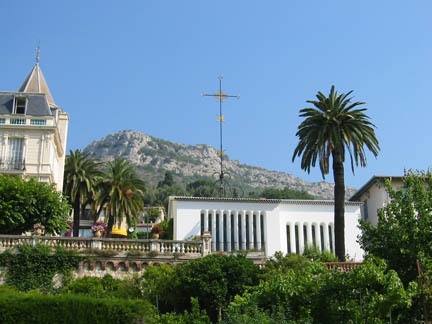 From my terrace, I could look out and see the chapel that Henri Matisse designed and decorated for the nuns who took care of him in his later years. All around me there was art and art history. Chagall created a mosaic for the town’s cathedral. Not far are the house where Renoir lived, the chateau where Picasso painted and a number of individual artist’s museums housing their renowned works. Nothing but inspiration all around. What I found most enticing though was the village itself. Vence, the City of Arts, is a mecca for artists, painters, sculptors and writers of all nationalities. The town consists of the more modern part and the cité historique where medieval walls dating back to Roman times surround the cathedral and the remaining old town. Within those walls are now shops, restaurants and housing. And it is here that artists have chosen to set up their ateliers or artist’s working galleries. As you walk along the ancient pathways, you view traditional, modern and contemporary works and often the artist him/herself. The atmosphere is immediate and intimate. You can spend hours in one gallery talking to the artist about any number of things. And when you leave, a café beckons so you wander over and have a coffee (or a beer) happy in your heart that life still exists where people take the time to savor it. And there is the food. And the beauty of the landscape. And there is the light. Ah, the light of southern France. This is the attraction for all artists past and present. But it was my desire for personal growth that took me back home. The desert as well has its beauty and light; a softer, more serene beauty that also calls to me. It is after all where I grew up. What I found missing in France was a certain essence that I experience in California. This sense that anything is possible, a feeling for innovation, creativity and expansion. The open spaces and glowing light of the desert welcomed me home with open arms. 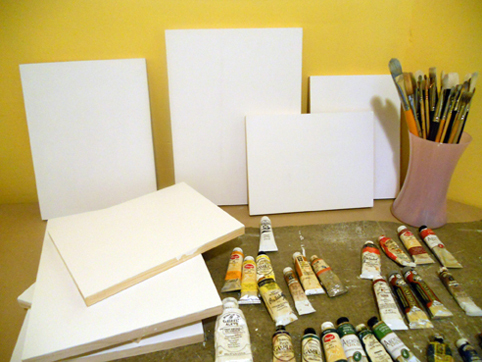 The eight panels that I ordered have arrived and are in need of gesso. Normally I work on canvas but the last several paintings I did were on panels. I found that I enjoyed working on the smooth surface. So I thought I’d begin again with panels. Gessoing is not my favorite thing. Though I am particular about the surface, and do put in the time applying the many coats of gesso and then sanding each one down, I find the process laborious. Out of curiosity, I decided to search online to see if I might find anything new on the subject. I am continually amazed at the incredible amount of information available at our fingertips. So I should not have been surprised to come across an incredible discovery: a new way to gesso. Okay so apparently it is not entirely new, the article was published in 2004. But it was new to me. And it was a JOY to discover. In an article entitled: Creating the Perfect Ultra-Smooth Canvas for Airbrush, A.D. Cook describes his process. Basically, he uses a squeegee to apply the gesso to the canvas. He applies many thin layers and does NOT sand between layers. This is a key time-saver. But the really unique discovery was that he uses a wet-sand technique, wetting the sandpaper to achieve a glass-like surface. When I tried this, I was overjoyed with the process and the result. Not only is the process simpler but the surface is exquisite. At least for my purposes. What a thrill to discover that a process as traditional as gessoing a canvas can be updated not only with modern materials but also with some creative thinking and a willingness to experiment. It got me to thinking about how many things we do automatically. Is it only the innovator or creative that questions the norm? And how would daily life be different if, from time-to-time, we took a look at where we could experience the joy of bringing something new to something old. It feels SOOOO good to be back on my path, settling in to work again. After spending 8 years in the south of France, in the lovely village of Vence, I’m back in the desert where I grew up. The beauty of both places is awe-inspiring. To look out at grand vistas, the beauty of the hills and mountains and desert is a blessing and my inspiration. Going from the lush hills of France to the sometimes stark desert in California is a visual and emotional shift. The desert is in my blood. Living under Mt. San Jacinto has always felt magnificent. I notice that I’m always attracted to places where there are mountains or hills adjacent to flat terrain. 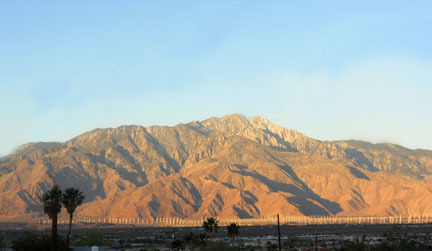 My hometown of Palm Springs, my adopted village of Vence and maybe one-day, the high desert of Taos. Childhood experience runs deep. Shifts and changes have occurred over the past year that have lead me back to painting. After a few years hiatus, exploring other loves and passions, I’m returning to my roots. My earlier weavings led to painting which led to explorations of creativity itself. 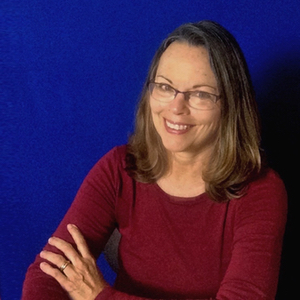 I wanted to apply what I learned as an artist to my life, to make my life a work of beauty and art, to live divinely inspired and to create what I came here to create. And for that, I must return to painting.